The best aesthetic surgeons perform to the highest standards and will take the time to listen to your every concern, answer all questions and discuss your options thoroughly. 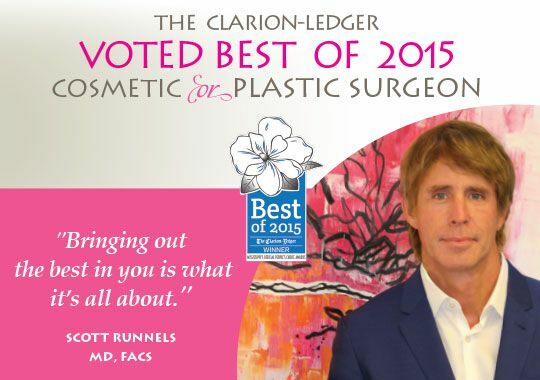 This may explain why Dr. Scott Runnels has been voted The Clarion Ledger’s 2015 “Best Cosmetic or Plastic Surgeon” by more than 10,000 readers statewide. Dr. Runnels was the first plastic surgeon in Mississippi to receive the prestigious Diamond Level Certification from Allergan, representing the top 1% of plastic surgeons in the nation performing procedures with Botox, Juvéderm, Latisse and Natrelle breast implants. Dr. Runnels knows the importance of being highly qualified. When choosing someone highly qualified, Dr. Runnels is committed to further refining the art of plastic surgery through both clinical and basic research as well as education. He is continuously asked to lecture to medical students, nurses, and fellow private practice physicians to help further their understanding of plastic surgery. He also actively participates in nursing updates, women’s workshops and health fairs. The latest NEW procedures offered at the Runnels Center and SKIN the SPA are minimally invasive include and they include Kybella, Obagi, and the SKIN Pen II. All procedures are NON surgical with NO downtime. After Dr Runnels and his amazing staff get you looking your best, you should hit the town with their NEW line of SKIN the Makeup!